Car washes are like showers for your car. They keep it looking, smelling and functioning at the top of its game. 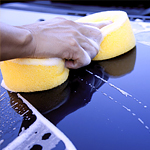 Car washes also clear away dust, pollen, air pollutants, salt, bug guts, tree sap and bird droppings, irritants that ruin your car's paint, finish and undercarriage over time. Ruined paint and finish and a rusted, nasty undercarriage are the fastest ways to age your car and land it in the shop. If you commute daily, park your car on the street most of the time and/or live in a harsh climate, a weekly car wash is a must. If you park your car in a garage most of the time and/or live in a place where the climate is generally fair, you can get by with car washes every other week. Either way, washing your car is a basic component of attentive automotive care, helping your vehicle look, feel and function properly for years to come.